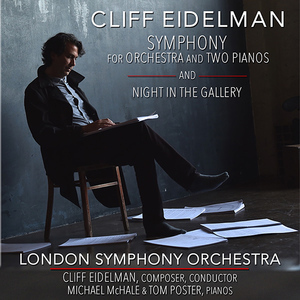 Fall of 2018 Cliff Eidelman's Symphony for Orchestra and Two Pianos will be released November 2018, recorded at Abbey Road Studios with the London Symphony Orchestra under the direction of Eidelman. Also planned for release in January 2019 is Night in the Gallery inspired by great paintings from the Louvre and other galleries around the world. 2017 releases include The Ancient World (EP), and Into the Unknown (EP). 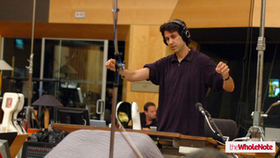 Eidelman's breakthrough came with his score Star Trek VI: The Undiscovered Country (1991), a stylish and powerful score that elicited a great deal of attention and acclaim. Star Trek VI continues to not only be a favorite among fans but is rated in the top 30 best film scores on "Filmtracks.com" which has a viewer rating of 1,500 film scores spanning several decades. 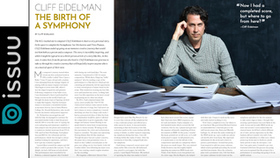 By the age of 24, Eidelman had composed a number of epic symphonic scores including the powerful Holocaust drama Triumph of the Spirit (1989) and Christopher Columbus (1992). Eidelman first ventured into comedy with back-to-back films Crazy People (1990) and Delirious (1990). Later he explored different approaches, often using a pared down orchestra, chamber orchestra, or a few chosen instruments to capture the intricacies of such character driven films as: Untamed Heart (1992), Leap of Faith (1992), A Simple Twist of Fate (1994), Now and Then (1995), the highest rated HBO film If These Walls Could Talk (1996), One True Thing (1998), Witness Protection (1999), An American Rhapsody (2001), the IMAX film Ocean Men (2001), Harrison's Flowers (2001), Sexual Life (2004), The Sisterhood Of The Traveling Pants (2005), Open Window (2006), He's Just Not That Into You (2009) and Big Miracle (2012) which is Eidelman's fifth collaboration with director Ken Kwapis. 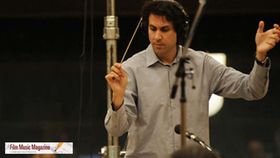 Eidelman broke into film scoring at the age of 22 when a performance recording of one of the two concert music commissions, the ballet Once Upon a Ruler and Celebration Symphony Overture he composed at Santa Monica City College reached director Monica Teuber. She was so impressed that she asked him to write some music based on the reading of her script. Eidelman composed eleven pieces and recorded the music at his home studio while still a student of music composition at the University of Southern California. Teuber hired him to write his first film score, Magdalene (1988), which starred Nastassja Kinski. The young composer took full advantage of this opportunity, launching his career with a huge 75 minute score. At only 22 years of age, Eidelman conducted the Munich Symphony using a 110 piece orchestra, 60 piece choir and 30 piece children's choir. Within a year of completing his first film score he was approached by director Robert Young to score his epic drama of WWII, Triumph of the Spirit. It was 1989 and Eidelman was just 24. The score was impressive and deeply moving, dramatically capturing the story of survival against all odds in a German concentration camp. So much so that it has caught the attention of many conductors since its composition and been performed by numerous orchestras. 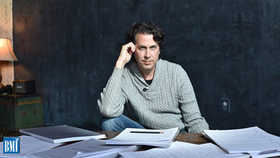 Eidelman created a suite from the score that was performed in June 2003 by The Los Angeles Master Chorale under the direction of Grant Gershon for their final concert at the Dorothy Chandler Pavilion prior to moving to Disney Hall. Soon after the release of the film Triumph of the Spirit, legendary composer Jerry Goldsmith took a real interest in Eidelman's career. 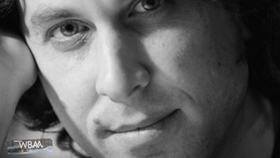 In an interview in 1999, he commented "Cliff Eidelman is a great talent with amazing potential." 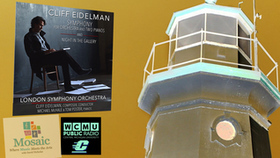 Enotes Music is proud to announce the release of two major works by composer Cliff Eidelman: Symphony for Orchestra and Two Pianos and Night in the Gallery. Recorded at Abbey Road Studios and featuring the London Symphony Orchestra and soloists Michael McHale and Tom Poster under the direction of the composer, Eidelman began composing his new Symphony for Orchestra and Two Pianos years ago prompted by an inner creative resolve. For decades, concert commissions for film composers were few and far between. The increasing popularity of John Williams' film music, and his visibility as conductor of the Boston Pops in the 1980s and '90s, led to his writing a number of concert works, but Williams was, for the most part, the exception to the rule. That is changing, some composers say, because orchestra managers are reaching the belated conclusion that film music communicates immediately to audiences, and the current trend of live-to-picture concerts of movie hits (everything from "Star Wars" to "Lord of the Rings") is bringing in big bucks. As a result, adventurous programmers are seeking new works by established film composers in hopes that audiences have developed a thirst for similarly melodic, even exciting, music by names they recognize even if there are no images to accompany them. 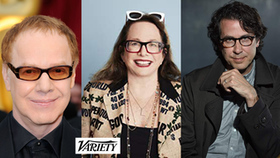 Several concert works by film composers will debut in the next few weeks including; - "Eleven Eleven," a violin concerto by Danny Elfman - "All American," an overture by Laura Karpman ("Underground"), Aug. 22 with the Los Angeles Philharmonic at the Hollywood Bowl. - A symphony for orchestra and two pianos by Cliff Eidelman ("Star Trek VI").